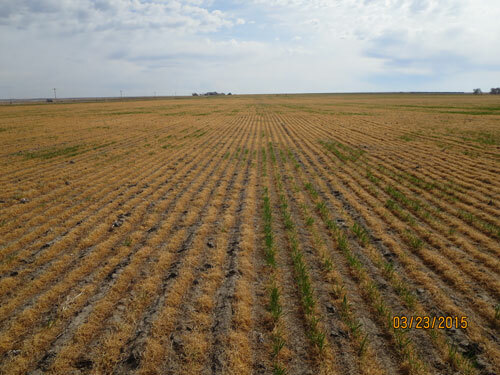 Follow-up: "It's the worst winterkill injury I've seen in 50 years" reports Bob Klein on the April 3 Market Journal after assessing a number of wheat fields in southwest Nebraska. Figure 2. With less than optimal growing conditions, variety differences, such as winterhardiness, become more evident. These variety plots are in Lincoln County. Figure 3. Some wheat over the top of the terrace and in wheel tracks firmed by a tractor is green. This points to the need to have firm rather than loose seedbeds. Figure 4. Much of this field was winterkilled due to silt that blew in during the Oct. 18, 2012 windstorm, changing and lessening soil quality for crop production. 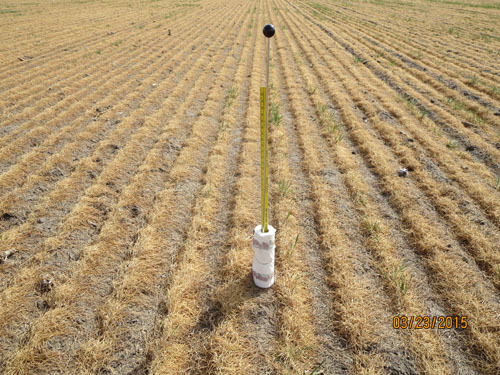 On Friday the McCook Automated Weather Data Network station was reporting 2.5 inches of soil moisture in a 4-foot profile under grass (not field). Normal is 4.5 inches, according to the data provided by the High Plains Regional Climate Center. Winter wheat varieties vary in tolerance to winter injury or winter kill. This is one of the many factors involved in the winter injury this year. Some varieties had almost 100% injury and kill. With the harsher winter conditions, the effects of practices such as seeding date and seedbed preparation are more evident. Early-seeded winter wheat used soil water last fall, leaving little moisture in the soil profile in some areas. Dry soil heats up and cools down six times faster than moist soil, increasing winter injury and winterkill. 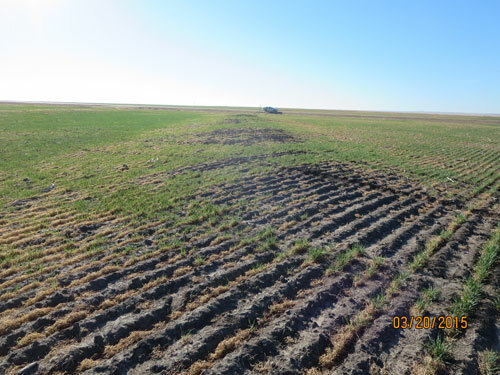 Late-seeded winter wheat also sustained damage in some areas as it was not well enough established to tolerate the harsh winter conditions. In some fields greener plants in wheel tracks suggest the importance of preparing a firmer seedbed throughout the field. Temperature fluctuations also can contribute to damage and winterkill. From last fall to now we saw some really high temperatures that dropped quickly to some pretty low temperatures. Our experience with winter wheat has been that if you get a couple of these cycles where the wheat starts growing and goes in and out of dormancy, it loses its winter hardiness. Drill type also can be a factor. There is less injury and kill with hoe drills versus disk drills. This is probably due to the soil sloughing off the sides of the furrow and protecting the crown and roots of the plant. Also, the furrow catches some snow. Seeding depth is also critical because crowns close to the soil surface are more subject to changes in temperatures, dry soil, and harsh winter conditions. 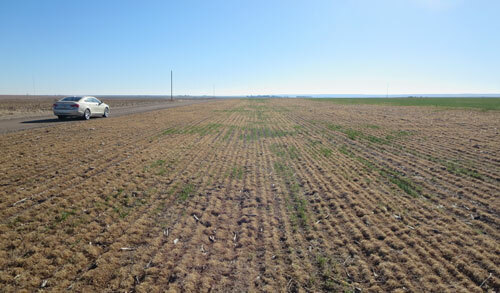 Producers assessing degree of damage will want to estimate their winter wheat yield potential. A reasonable yield estimate allows growers to predict if it is in their best interest to destroy their wheat and plant a summer crop or leave the wheat for harvest. Before making such a decision, growers should be aware of any restrictions imposed by government programs, crop insurance, or previous herbicide use. that there is an average of 16,000 kernels per pound. Late-planted wheat or winter wheat suffering from winter injury will tiller less and have fewer heads. To use Table 1, count the number of plants per foot of row. It is best to use at least 5 feet of row in at least five sites within the field and calculate the average number of plants per foot of row. If the stands are uneven, for example the stand is better or worse in the wheel tracks, make sure your percentage of samples in these areas accurately represents the proportion of these areas in the whole field. Locate the column in the table that corresponds to your average number of plants per foot of row and then move down that column until it intersects with the row corresponding to your row spacing. This is your estimated yield. Table I. Estimated wheat yield potential. Always contact your farm service agency, crop insurance representative and any others who need to be informed before making any management decisions on fields that have partial or complete winter injury or kill. 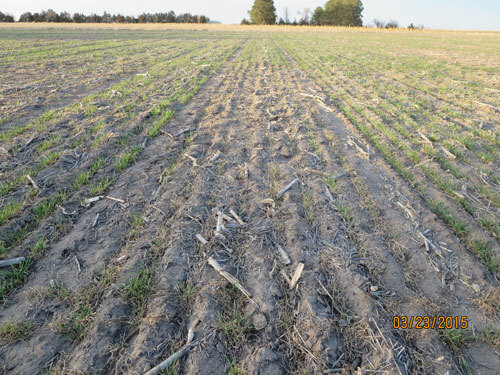 If whole fields are dead, it might be possible to plant these fields to a summer row crop or forage crop later this spring, depending on plant-back restrictions from any residual herbicides that have been applied to the wheat. Many of the commonly used sulfonylurea herbicides, including Ally, Ally Extra, Finesse, Glean, Amber, Peak, Rave, Maverick, Olympus, and PowerFlex, are very persistent and have fairly long crop rotation guidelines. Always refer to the specific herbicide label regarding crop rotation guidelines and restrictions. Label guidelines for crop rotation are often complicated by soil pH and geography. Some product labels have rigid crop rotation restrictions, while other labels allow shorter intervals in the case of catastrophic crop failure, as long as the producer is willing to accept the risk of crop injury. Another confusing issue may be the existence of supplemental herbicide labels with shorter crop rotation guidelines than the regular label, or special footnotes to crop rotation tables in the label. If fields have not been treated with herbicides or treated with herbicides that allow crops like grain sorghum or forage, these may be your best option. We do not want to kill the wheat and leave the field subject to wind and water soil erosion. Future CropWatch articles will examine alternatives a producer might consider.